Publications | Lewis Engel, Ph.D.
Ph.D., & David Manfield, Ph.D. (2017). Use of the Flash Technique in EMDR therapy: Four case examples. Journal of EMDR Practice and Research, 11, 195-205. I have written Imaginary Crimes, a popular, widely translated and well-respected book on the subtle role that guilt can play in causing self-defeating behaviors. This book, based on Control Mastery Theory, argues that many of our most serious psychological problems are due to a special kind of guilt: the hidden guilt we feel toward our parents or other loved ones. Somewhere back in childhood we came to believe that by achieving success, independence, or happiness we would harm those we love. We judged ourselves guilty of “imaginary crimes” and have been punishing ourselves ever since. 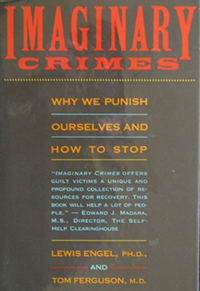 This book details the six most common types of “imaginary crimes,” including ‘outdoing’ (being more successful than your parents); ‘love theft’ (being favored over a sibling); ‘disloyalty’; and ‘basic badness’. Because of guilt over these “crimes” we can become our own worst enemy. It was published in both hardback and paperback editions in English. Translations were published in France, French Canada, Germany, and Brazil. The book was widely praised by leading psychologists and psychiatrists as well as experts in chemical dependency. “Imaginary Crimes: Resolving Guilt and Writer’s Block,” in EMDR: Case Book, edited by Philip Manfield, Norton, New York, 2003. A case study utilizing Control Mastery Theory and EMDR in the treatment of writer’s block. “Self-Care for Couples,” in The Medical Self-Care Book, edited by Tom Ferguson, Simon/Shuster, New York, 1979. Tools for couples to use for building and maintaining a thriving relationship.